TrafficTalk is applying the power of mobile crowdsourcing to solve one of the most painful challenges faced by most of us every day — avoiding traffic tie-ups on the way to and from work. 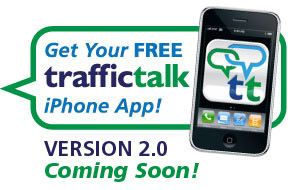 TrafficTalk is the answer. We offer a free service for drivers on mobile phones, where people come together in a real-time environment and share details about traffic conditions, helping one another avoid or escape back-ups. We’re taking the power of CB Radio -- the original mobile crowdsourcing tool--and unleashing it to the masses. People connect to different localized “communities” across a metro area, each focused on a different traffic corridor, so the information you get is focused and relevant. 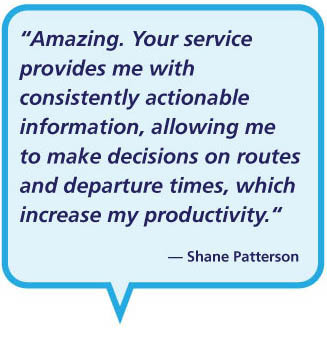 As a voice-based service, TrafficTalk allows eyes to remain on the road and hands on the wheel. The robust traffic details of TrafficTalk’s information sharing method make it the first choice when you want to know what lies on the road ahead. The power of real-time traffic information.